Moss on your roof can retain moisture, harbor mold, and contribute to the early decomposition of your roof. We remove the moss manually - no pressure washing and no "brooming" of the roof is employed in the cleaning process. Our goal is to remove the moss with minimal impact to the texture and integrity of your roof. A pressure washer even at low pressure may invalidate the manufacturer's warranty of your roofing materials, so we just won't use one. It's better for your roof and safer for your home to simply do it with careful, old-fashioned elbow grease. Loose debris is also removed with a blower before and after the moss is removed. Seasonal leaf debris removal, especially where it collects in valleys, is a snap for us and we're glad to do it! Lets face it, there are still a few chores that technology hasn't quite caught up with...yet. In spite of the manual labor involved, it's important to keep those rain gutters and downspouts clear and fully-functional. Why not have us do it for you? Many home-owners and property managers have already "outsourced" this grunt work. Why not you? We're careful to remove the leaf-fall and debris. We won't simply run it down the downspout and potentially clog the line. As with our roof cleaning service you can expect careful, responsible service. 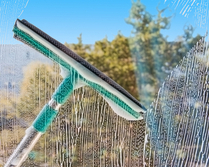 To compliment our roof and rain gutter cleaning service, we also offer professional exterior residential window cleaning. We can help you get those hard-to-reach 2nd floor windows and skylights bright and gleaming again. Don't dim the light or lose your beautiful view behind layers of dust. We're very handy with ladders and we can help! The screens will be removed and cleaned, and the sills and exterior tracks wiped out as well. Please note that our window cleaning service is offered as an add-on option for any of our roof and gutter cleaning customers, but it is not currently offered as a stand-alone service. The exterior collector surfaces of solar panels tend to collect dust and debris just like skylights and windows. This can block some sunlight and reduce the efficient production of electrical energy for photovoltaic panels and diminish the heat absorbed by solar heat collectors. Keeping the surfaces clean can mean real energy $aving$ for you. If you've invested in this green technology, save yourself some green and let us help you keep them clean and operating efficiently. Most manufacturers recommend a specific method of cleaning for your panels. With a little information, we can help research and provide the necessary cleaning method. It's true, our gutter and roof cleaning services will bring Fall mess and clumps of moss down from the roof and under foot, but WE PROMISE, we won't leave you with the mess. At the end of every roof and gutter job, we clean up after ourselves and our goal is to have your yard and walkways looking better when we leave than when we arrived.